Second half goals from Marvin Elliott and Brett Pitman guided Bristol City further from the drop zone and badly dented Watford's play-off hopes. The home side had gone ahead after 19 minutes through Don Cowie's shot. But Nicky Maynard, making his first start since being injured pre-season, tapped-in to level on 36 minutes. Elliott's headed effort from Maynard's cross put the West Country side ahead and Pitman sealed victory with an emphatic strike in extra time. The win moves City into 17th position, seven points clear of the relegation zone, but Watford's slump continues as the Hornets now have gone eight games in all competitions without a win. In an end-to-end game, City had the first clear chance with winger Martyn Woolford finding Albert Adomah in the box and the former Barnet man's shot flew just wide. But good work by Danny Graham gave Watford manager Malky Mackay something to cheer about, when his shot was not held by David James, allowing Cowie a simple finish. A quickly taken throw-in from Lewin Nyatanga allowed Woolford to cross for Maynard's equaliser, with the home defence seemingly immobilised. The home side pressed forward and James did well to hold a powerful header by Graham and a fierce shot from Andi Weimann, while Elliott wasted a chance after a David Clarkson pass. After the break, Cowie went close with a 25-yard drive before Maynard's cross was headed goalwards by in-form midfielder Elliott, with Hornets' keeper Scott Loach unable to do more than send it into the top of the net. Watford pressed forward in the latter stages, but Graham was guilty of wasting their only real chance as he sliced over the City net. Club top scorer Pitman, who had come on as a substitute with Andy Keogh for the hard-working Maynard and Clarkson, settled the issue when he powered home Adomah's cross in the third minute of injury time. 90:00+3:46 The referee blows for the end of the match. 90:00+2:31 Assist by Albert Adomah. 90:00+2:31 GOAL - Brett Pitman:Watford 1 - 3 Bristol City Brett Pitman finds the net with a goal from inside the box high into the middle of the goal. Watford 1-3 Bristol City. 90:00+0:44 Unfair challenge on Martyn Woolford by Adam Thompson results in a free kick. Lewin Nyatanga crosses the ball from the free kick left-footed from left wing, Scott Loach makes a save. 90:00+0:44 Booking Adam Thompson is shown a yellow card. 88:03 Liam Fontaine fouled by Marvin Sordell, the ref awards a free kick. Louis Carey takes the free kick. 88:03 Booking Booking for Marvin Sordell. 86:23 Inswinging corner taken left-footed by Martyn Woolford from the right by-line, clearance made by Martin Taylor. 83:58 Foul by Adam Thompson on Lewin Nyatanga, free kick awarded. Indirect free kick taken by David James. 82:51 Foul by Liam Fontaine on Danny Graham, free kick awarded. Free kick crossed right-footed by Don Cowie, Brett Pitman manages to make a clearance. 82:38 The referee blows for offside. Free kick taken by Scott Loach. 81:15 Substitution (Watford) makes a substitution, with Matthew Whichelow coming on for Ross Jenkins. 80:27 Foul by Daniel Drinkwater on Martyn Woolford, free kick awarded. Free kick crossed by Liam Fontaine. 80:09 Danny Graham is caught offside. David James takes the indirect free kick. 78:57 Substitution Brett Pitman is brought on as a substitute for Nicky Maynard. 78:40 Substitution David Clarkson goes off and Andrew Keogh comes on. Correction - 77:36 The assistant referee flags for offside against Albert Adomah. Scott Loach takes the free kick. 75:35 Shot from deep inside the area by Danny Graham clears the bar. 74:26 Short corner worked by Daniel Drinkwater. 73:08 Substitution Marvin Sordell on for Andreas Weimann. 71:36 Nicky Maynard gives away a free kick for an unfair challenge on Martin Taylor. Lee Hodson crosses the ball from the free kick right-footed from left wing, Steven Caulker makes a clearance. 69:43 Substitution Daniel Drinkwater is brought on as a substitute for Stephen McGinn. 68:32 The assist for the goal came from David Clarkson. 68:32 GOAL - Marvin Elliott:Watford 1 - 2 Bristol City Marvin Elliott finds the net with a headed goal from deep inside the penalty area. Watford 1-2 Bristol City. 67:06 Marvin Elliott fouled by Adam Thompson, the ref awards a free kick. Direct free kick taken by David James. 66:52 The referee blows for offside. Free kick taken by Scott Loach. 64:54 Stephen McGinn produces a cross, Louis Carey manages to make a clearance. 63:59 David Clarkson is caught offside. Scott Loach restarts play with the free kick. 58:23 John Eustace produces a cross, Steven Caulker makes a clearance. 55:57 Unfair challenge on David Clarkson by Martin Taylor results in a free kick. Free kick crossed left-footed by Lewin Nyatanga. 54:32 Kalifa Cisse gives away a free kick for an unfair challenge on John Eustace. Don Cowie shoots direct from the free kick. 54:23 Stephen McGinn crosses the ball, Steven Caulker makes a clearance. 53:35 Handball decision goes against Ross Jenkins. David James restarts play with the free kick. 51:17 The assistant referee flags for offside against Andreas Weimann. Indirect free kick taken by David James. 50:05 Andreas Weimann takes a shot. Lewin Nyatanga gets a block in. 48:59 Adrian Mariappa crosses the ball, Liam Fontaine manages to make a clearance. 48:11 Handball decision goes against Kalifa Cisse. Indirect free kick taken by Andreas Weimann. 47:47 The ball is crossed by Albert Adomah, clearance by Martin Taylor. 47:28 Louis Carey takes a shot. Lee Hodson gets a block in. 46:45 Marvin Elliott delivers the ball, clearance by Lee Hodson. 45:31 Unfair challenge on Martin Taylor by David Clarkson results in a free kick. Scott Loach takes the direct free kick. 45:00+1:11 The half-time whistle blows. 44:44 Foul by Marvin Elliott on John Eustace, free kick awarded. Scott Loach takes the direct free kick. 44:07 Shot from deep inside the area by Adam Thompson goes over the bar. 43:04 Marvin Elliott concedes a free kick for a foul on Adam Thompson. Free kick crossed right-footed by Adrian Mariappa from own half, Albert Adomah manages to make a clearance. 40:59 Danny Graham is caught offside. Free kick taken by David James. 39:43 David James is penalised for a handball. Ross Jenkins restarts play with the free kick. 39:24 The ball is delivered by Stephen McGinn, Lewin Nyatanga makes a clearance. 37:55 Danny Graham takes a shot. Save by David James. 37:33 John Eustace takes a shot. Save by David James. 36:54 Liam Fontaine concedes a free kick for a foul on Andreas Weimann. Don Cowie delivers the ball from the free kick right-footed from left channel, clearance made by Liam Fontaine. 36:14 Marvin Elliott produces a right-footed shot from the edge of the area and misses to the left of the goal. 34:32 Foul by Marvin Elliott on Adam Thompson, free kick awarded. Scott Loach takes the free kick. 33:33 Don Cowie takes a shot. Save by David James. 31:45 Martyn Woolford provided the assist for the goal. 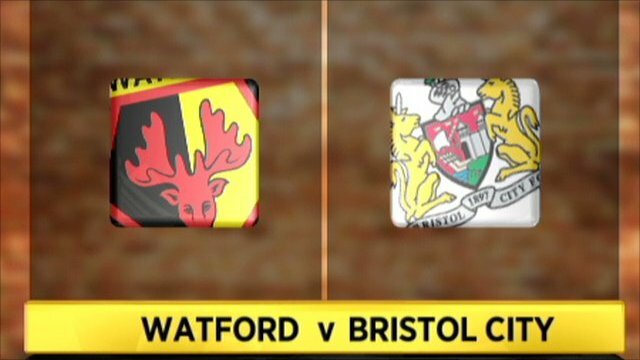 31:45 GOAL - Nicky Maynard:Watford 1 - 1 Bristol City Nicky Maynard gets on the score sheet with a goal from close in to the bottom left corner of the goal. Watford 1-1 Bristol City. 26:32 Free kick awarded for an unfair challenge on Stephen McGinn by Marvin Elliott. Don Cowie crosses the ball in from the free kick. 24:53 Foul by Kalifa Cisse on Ross Jenkins, free kick awarded. Direct free kick taken by Adam Thompson. 20:51 Nicky Maynard is ruled offside. Free kick taken by Scott Loach. 18:48 Assist on the goal came from Danny Graham. 18:48 GOAL - Don Cowie:Watford 1 - 0 Bristol City Don Cowie gets on the score sheet with a goal from deep inside the penalty box to the bottom left corner of the goal. Watford 1-0 Bristol City. 17:03 Corner taken left-footed by Lewin Nyatanga from the right by-line to the near post, Foul by David Clarkson on Scott Loach, free kick awarded. Scott Loach takes the direct free kick. 16:54 Kalifa Cisse crosses the ball, clearance made by Martin Taylor. 15:54 Free kick awarded for a foul by John Eustace on Kalifa Cisse. David James takes the direct free kick. 10:20 Albert Adomah has an effort at goal from just inside the box that misses to the left of the goal. 7:46 Andreas Weimann takes a shot. Blocked by Liam Fontaine. 5:58 Albert Adomah produces a cross, clearance by John Eustace. 5:28 Free kick awarded for an unfair challenge on Albert Adomah by Lee Hodson. The free kick is swung in right-footed by Louis Carey, clearance made by Martin Taylor. 4:14 David Clarkson takes a shot. Save by Scott Loach. 2:35 Corner taken by Danny Graham from the right by-line, Headed effort on goal by Adam Thompson from inside the penalty box misses to the right of the goal. 2:11 Kalifa Cisse challenges Danny Graham unfairly and gives away a free kick. John Eustace restarts play with the free kick.